რეჟისორი, კინოპროდიუსერი, სცენარისტი, ავტორი, პოლიტიკური აქტივისტი, მსახიობი. მაიკლ ფრენსის მური (ინგლ. Michael Francis Moore; დ. 23 აპრილი, 1954) — ამერიკელი კინოდოკუმენტალისტი. მური არის რეჟისორი და პროდიუსერი ფილმისა „ფარენჰაიტი 9/11“ (2004), რომელიც ამერიკის შეერთებული შტატების 43-ე პრეზიდენტის ჯორჯ უოლკერ ბუშს და მის მიერ 2001 წლის 11 სექტემბრის შემდეგ დაწყებულ სამხედრო ოპერაციებს კრიტიკულად თვალით დანახულს წარმოაჩენს. ფილმი გახდა ამერიკაში ყველაზე მაღალშემოსავლიანი დოკუმენტური ფილმი და მოიგო ოქროს პალმის რტო. მისი ფილმი „ბოულინგი კოლუმბინასთვის“ (2002), რომელიც 1999 წლის 20 აპრილს Columbine High School-ში დატრიალებულ ხოცვა-ჟლეტას იკვლევს, მიიღო ოსკარი. მისი ორი ფილმი, „ფარენჰაიტი 9/11“ და „ჯანდაცვა“ (2007), რომელიც იკვლევს ჯანდაცვის სისტემას და მის მდგომარეობას ამერიკის შეერთებულ შტატებში, არის ტოპ 10 ყველაზე შემოსავლიან დოკუმენტურ ფილმებს შორის. 2008 წლის სექტემბერში, მურმა ინტერნეტში განათავსა მისი პირველი უფასო ფილმი „Slacker Uprising“. მან ასევე, დაწერა და ითამაშა სატელევიზიო შოუში TV Nation, სატირულ სატელევიზიო სერიალში და სატირულ შოუში The Awful Truth. მისი პუბლიკაციები და კინემატოგრაფიული ნამუშევრები აკრიტიკებენ გლობალიზაციას, აშშ-ის მიერ იარაღის წარმოებას, აშშ-ის პრეზიდენტებს ბილ კლინტონს და ჯორჯ უოლკერ ბუშს, სამხედრო ოპერაციებს ერაყში, აშშ-ის ჯანდაცვის სისტემას და კაპიტალიზმს. 2005 წელს ჟურნალმა „ტაიმმა“ მური შეიყვანა მსოფლიოს 100 გავლენიან ადამიანს შორის. მაიკლ მური დაიბადა მიჩიგანის შტატში, ქალაქ ფლინტის გარეუბანში. დედამისი ჰელენ ვერონიკა მუშაობდა მდივნად, მამამისი ფრენსის რიჩარდ „ფრენკ“ მური კი, საავტომობილო ქარხნის მუშა იყო. ამ დროისთვის ფლინტში გაჩნდა უმსხვილესი ამერიკული საავტომობილო კორპორაციის „General Motors“-ის ქარხნები, სადაც მისი მშობლები და ბაბუა მუშაობდა. მისი ბიძა LaVerne იყო United Automobile Workers-ის მუშათა გაერთიანების დამფუძნებელი და მონაწილეობდა 1936–1937 წლებში „General Motors“-ის წინააღმდეგ მიმართულ გაფიცვაში. მაიკლ მურს აქვს ირლანდიური, შოტლანდიური და ინგლისური წარმომავლობა. იგი გაიზარდა როგორც კათოლიკე. მურს აქვს გადაღებული რამდენიმე მუსიკალური ვიდეო, მათ შორის, „Rage Against the Machine“-ის ორ სიმღერაზე: „Sleep Now in the Fire“ და „Testify-ზე“. ვიდეოში „Sleep Now in the Fire“, მიუხედავად ნიუ-იორკის მერიის ნებართვისა, მურს აკავებს პოლიცია იმ დროს როცა ჯგუფი ღია ცისქვეშ, უოლ-სტრიტზე უკრავს Sleep Now in the Fire-ს. კადრები შესულია ფილმში — „უოლ-სტრიტი“. მური, ასევე, ავტორია ჯგუფ R.E.M.-ის 2001 წელს გადაღებული ერთ-ერთი ვიდეოს და System of a Down-ის — „Boom!“-ის. მური არის კათოლიკე, მიუხედავად ამისა, ის არ ეთანხმება ეკლესიის აზრს აბორტის და ერთი სქესის მქონე ადამიანების ქორწინებასთან დაკავშირებით. 2016 წლის თებერვალში მური მოათავსეს საავადმყოფოში პნევმონიის დიაგნოზით. Moore, Michael (1998). Adventures in a TV Nation. New York: HarperPerennial. ISBN 0-06-098809-6. ↑ შეცდომა თარგის გამოძახებისას: cite web: პარამეტრები archiveurl და archivedate მითითებული უნდა იყოს ორივე, ან არცერთი.Michael Moore Fights to Save Theatre in Traverse City. The Detroit News/Theatre Historical Society of America. დაარქივებულია ორიგინალიდან - June 2011. წაკითხვის თარიღი: October 19, 2013. ↑ 2.0 2.1 Documentary Movies. Box Office Mojo (2007). წაკითხვის თარიღი: March 26, 2011. ↑ Michael Moore releases Slacker Uprising for free on Net. www.meeja.com.au (September 24, 2008). წაკითხვის თარიღი: September 24, 2008. ↑ "And Now, for the OTHER Republican Convention" August 13, 2000, Michael Moore.com დაარქივებული დეკემბერი 20, 2013 საიტზე Wayback MachineWayback Machine. ↑ Joel Stein. “Michael Moore: The Angry Filmmaker“, Time, April 18, 2005. წაკითხვის თარიღი: July 19, 2007. ↑ “Michael Moore. Full biography“, New York Times. წაკითხვის თარიღი: May 12, 2010. ↑ Michael Moore Biography (1954–). Film Reference. წაკითხვის თარიღი: July 19, 2007. ↑ Rapoport, Roger (2007). Citizen Moore: the life and times of an American iconoclast. RDR Books, გვ. 19. ISBN 1-57143-163-2. ↑ Stated in Moore's film, Roger & Me, 1989, and Capitalism: A Love Story, 2009. ↑ Williamson, Marianne. 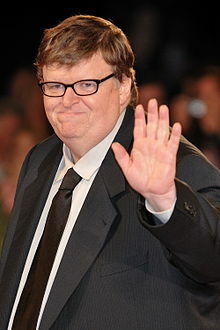 (September 18, 2007) Filmmaker Michael Moore's Spirituality. O: The Oprah Magazine. წაკითხვის თარიღი: September 16, 2010. ↑ Green Left Weekly: Rage against Wall Street. ↑ Michael Moore divorce: Flint native splits with wife of 21 years. mlive.com. წაკითხვის თარიღი: July 19, 2013. ↑ “Filmmaker Michael Moore's Divorce Is Finalized“, abcnews.go.com, July 23, 2014. წაკითხვის თარიღი: July 23, 2014. ↑ Rahner, Mark. “"Sicko", new Michael Moore film, takes on the health-care system“, T Seattle Times, June 26, 2007. წაკითხვის თარიღი: June 30, 2007. ↑ Elliott, David. “Moral outrage, humor make up Michael Moore's one-two punch“, SignOnSanDiego, June 29, 2007. წაკითხვის თარიღი: June 30, 2007. ↑ Moore, Michael. “12, 2003 Michael Moore to Wesley Clark: Run!“, MichaelMoore.com, September 12, 2003. წაკითხვის თარიღი: September 23, 2009. ↑ News Service, Canwest. “Moore may tackle gay rights“, Canada.com, June 11, 2007. წაკითხვის თარიღი: September 23, 2009.